It seems to be as light as a Japanese bonsai, but it looks great in hand. It is slightly bent with a curvature at the middle of it. Quality materials are selected. The chosen colors are silver and white. The battery cover opens easily. You will find on the upper side of the phone the 3.5 mm jack, the on / off buttons and the lock or unlock the display quickly button. On the left side appears the volume control and the microUSB port. This phone doesn’t have a key to rapid onset of the camera which is not such a great loss. The speaker is located on the back near to the 5 megapixel camera and the LED flash. The sound offered is a quality one because it has a high fidelity speaker. The TFT screen has 2.6 inch with a resolution of 480×320 pixels and 256,000 colors. This phone did well against the sunlight because it has the contrast advantage which helps in viewing the information. At the base of this phone are 4 capacitive keys with role in searching, back, customizing the display and navigation between the four customizable pages with home role. It brings a 800 MHz processor, 512 MB RAM, 512 MB ROM and also it offers a microSD up to 32 GB. This smartphone comes with Android 2.3.3 Gingerbread and Sense UI. Interestingly is because of 480×320 pixels resolution when you will keep the phone into the landscape mode, you feel that you are in portrait and vice versa. Some applications will run only in the landscape mode. You have access to a range of ChaCha functions by simply pressing the release screen button and I mean the phone, e-mail, camera and messages. 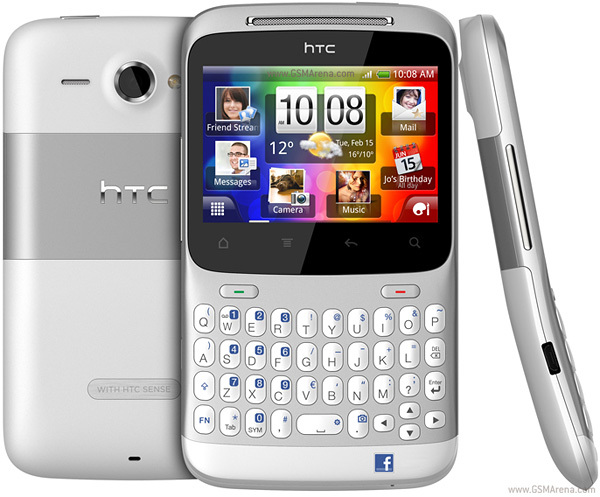 The applications that comes from factory are: Books, Calculator, Quick Search, Voice Search, HTC hub, Gmail, Peep. The complete menu is seasoned with 3G and download speeds of up to 7.2 Mbps, Wi-Fi b/g/n Wi-Fi Hotspot, Bluetooth 3.0, microUSB, 3.5 mm jack. The smartphone charger is designed to have double role. If you will unplug the cable, the phone will instantly become an intermediary between PC and phone. The 5 megapixel sensor which brings autofocus and LED flash records at 720×480 pixels with 30 fps. This smartphone also brings a 0.3 megapixel VGA secondary camera for video calls. This smartphone brings a battery of 1250 mAh. Under moderate use the battery last 2 days. Stay tuned! We will keep you updated with the latest news about HTC ChaCha.